Now in his 80th year, Ian Hamilton Finlay continues his garden outside Edinburgh, Little Sparta. This landscape of groves, paths, and ponds is a meditation on the sublime, where form and idea are conjoined. Its purpose is to revive the serene presence and relevance of the classical past, in order to restore its immortal grace and logic to our polluted consciousness. This process is what Finlay calls "classical rearmament." 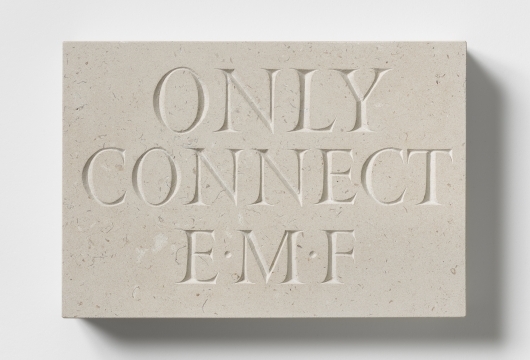 This exhibition is composed of pure forms, inscribed with words, phrases, or poetry that often implies an uncompromising analysis of contemporary culture. In a world overwhelmed by pop culture and ephemera, Finlay's work is an affirmation of the eternal. On various themes that Finlay has published since the 1960's. The UBS Gallery is located in Midtown, at 1285 6th Ave. @ 51st Street, and is open Monday – Friday from 8 a.m. to 6 p.m. Admission is free.